One advantage of doing business with Royal De Gruijter & Co. is that we are thoroughly familiar with the top end of the market and with the requirements of the most discerning customers. Many opt to delegate the entire process to us, and can do so with confidence. We have specialists in every discipline: staff who have extensive experience in packing valuable works of art, for example. And staff who have the technical expertise required to carry out specific jobs in your new home. Perhaps your wishes go even further. You would like a stylist to decorate, furnish and equip your new home. No problem! We can source all the necessary expertise and manpower, although we will only engage service providers who share our concern for quality. You can safely leave the coordination of their activities to us. Last but not least, please remember that our customer focus also extends to your children and pets. Your personal account manager is on hand to answer your questions at any time of the day or night. He or she will be personally involved in every stage of the process. Every little detail will be under control at all times, leaving you absolutely nothing to worry about. Advanced software, fully equipped and climate-controlled vehicles, portable lifts and other state-of-the art equipment guarantee the highest possible efficiency. 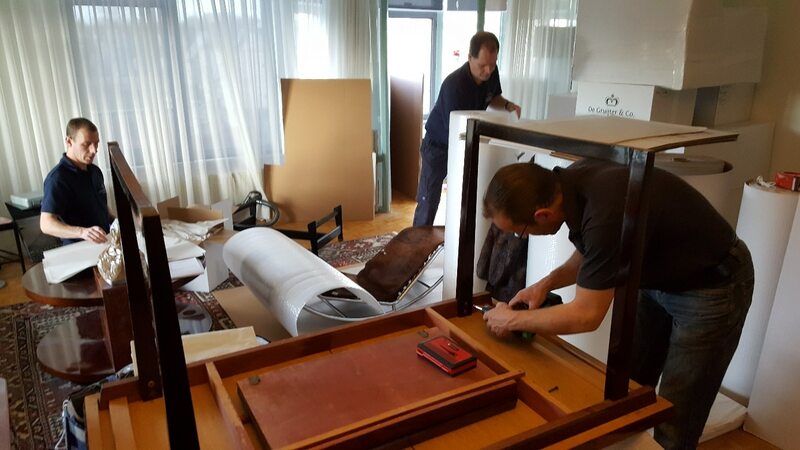 Your belongings – including works of art, antiques and objects of great sentimental value – are in the safe hands of trained professionals, all of whom are committed to offering you a care-free moving experience. We offer you an informative visit by one of our specialists, free of charge. This service provides you the opportunity to discuss your personal desires and preferences. Without any obligations.